The April issue – our 13th birthday edition! – is out now, from over 200 outlets across the North East. Our cover stars are Holy Moly & The Crackers; Catharina Joubert chats with the folk rock group about the unique sonic madness of their third album, with exclusive images by Amelia Read. This issue also features the release of our 13th anniversary compilation album, available to download now from our Bandcamp page. Featuring some of the most exciting North East artists around, it’s available to download for FREE! As always, it’s a busy ol’ month! Find out about Pigs Pigs Pigs Pigs Pigs Pigs Pigs at Sage Gateshead; Worry Party EP launch at Cobalt Studios; Half Man Half Biscuit at Boiler Shop; The Shakin’ Nightmares at Hey Base Camp; AK/DK at The Cumberland Arms; Luke Sital-Singh at The Cluny; David Thomas Broughton at The Waiting Room and Cobalt Studios; Ponyland album launch at Think Tank? ; DEAFKIDS at The Cluny; Twin Beam EP launch at Cobalt Studios and much more. 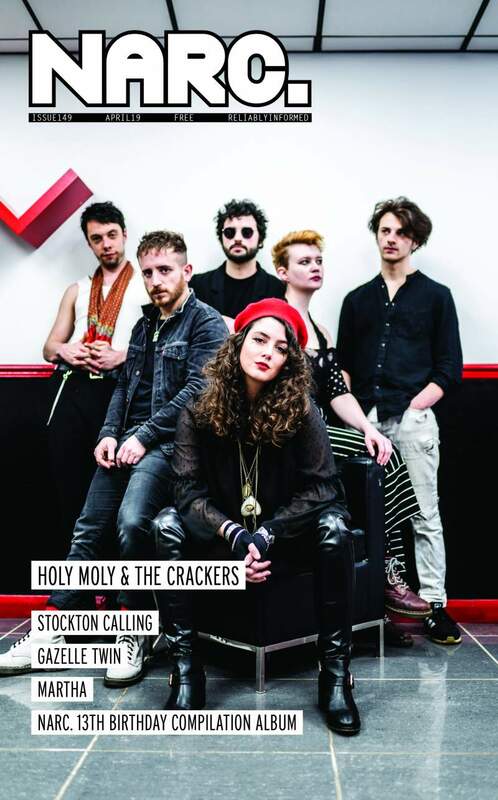 In the Culture pages, dive into alternative theatre at Darlington’s Jabberwocky Market; enjoy quirky performances at Moving Parts Newcastle Puppetry Festival; find out more about comedian Kiri Pritchard-McLean and Locker Room Talk director Anna Ryder; plus Crackle. Dust. at Dance City, ARC and more; Equus at Northern Stage; Angelos & Barry Live Together at Hullabaloo; Princess & The Hustler at Live Theatre; Durham Adventure Festival at Gala Theatre; Lou Sanders’ Shame Pig at ARC; Ex Voto and Forest exhibitions at Side Gallery; Through Sound – Collaborating Experience at Pineapple Black; Northern Sustainable Fashion Revolution at various Newcastle venues; Hexham Book Festival; reviews of Kate Fox’s Where There’s Muck, There’s Bras at Hullabaloo; Barby Asante’s Declaration of Independence at BALTIC; Testament’s WOKE at Arts Centre Washington; Trainspotting Live at Northern Stage and much more. Interview-wise, Damian Robinson talks to experimental artist Gazelle Twin about her dangerous, brave and highly antagonistic live show; Steve Spithray talks about pastoral influences, rebirth and regeneration with prolific Teesside musician Andrew Johnson; Ben Lowes-Smith talks to articulate musician Craig Clark about how travel influenced his new album; Ali Welford talks to Durham’s DIY pop punks Martha about the release of their third album; Johnathan Ramsay chats with Newcastle grime newcomers NE Dons ahead of their second EP release; Lee Hawthorn catches up with indie pop quintet St. Buryan about their rapturously received new material; Damian Robinson discovers what’s in store on Newcastle trio ThreadBear’s debut album and Steve Spithray delves into the line-up for Stockton Calling’s tenth anniversary event, taking place this month. In Mixtape, comedian Patrick Monahan tells us about his favourite music. We review demos by Culloden, Fowl, The Vellacos, Paul Broadhead and Dripp; there’s album reviews of new releases by Sunn O))), The Artisans, Cocaine Piss, The Mountain Goats, Damian Jurado and more; plus reviews of tracks by SQUARMS, Rojor, Faithful Johannes, What We Call Progress, Prince Bishops and Trunky Juno among others and live reviews of Du Blonde, Demob Happy, Eddie & The Valkyries, Group Listening, Snapped Ankles and many more.